My wife often comments that since it takes so long for me to get ready to go out as a woman, is it worth it? Of course, it is worth it (what a silly question), but she does make a legitimate observation, i.e., it does take me a long time to get ready. As a result, when I go out as a woman, I want to look as perfect as possible, which means flawless makeup and not a hair showing that should not be showing. I love putting on makeup and if I have the time, I indulge myself in the makeup process and can while away an hour or so putting on the war paint. But usually I don’t have the time and I must get the job done as quickly as possible. After years of practice, I have my makeup routine down to about 35 minutes if everything goes smoothly. I see no way of reducing that time without cutting corners and I refuse to cut corners, so I invest 35 minutes putting on my face. The actual dressing is the easy part. I usually have my outfit picked out beforehand and I can have it on from soup to nuts, or should I say from girdle to wig in 15 minutes or less. The wig I wear these days is a “shake and bake” wig. I just shake it out, put it on my head, make a few adjustments, and I’m done. I use self-stick pre-glued nails and they go on in less than five minutes with no muss or fuss. So, once my makeup is on, I can be out the door in less than a half hour. Now the part I hate: hair depilation. I am hairy. It is everywhere and depending on what I plan to wear, it can take 30 minutes to an hour just to get rid of it all. I have long legs and they alone take some time to depilate. If I wear anything other than a long sleeved dress or top, then I have to depilate my arms. If I am wearing anything that exposes my shoulders, then they must be depilated, too. And so it goes for my chest and back if I am wearing anything that is low-cut in the front or back. Shaving my face is a joy in comparison. When I come face-to-face with my hairy problem, I start thinking that my wife might be right, is it worth it? Yes, it’s hard work, but I still think it is worth every minute of it. Wearing Fleur Du Mal pants, Rag & Bone blazer and Alexander Wang sandals. Your face is the first thing people notice about you. That means your makeup can make or break a feminine first impression. Does your makeup application look more drag queen than beauty queen? Or have you mastered the art of subtle, beautiful makeup? No matter what your skill level, there are a few key strategies that apply to everybody. 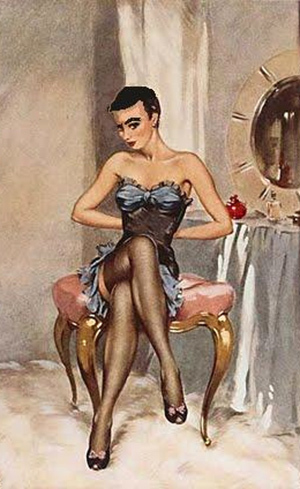 Read on for my top 6 makeup tips for crossdressers and transgender women. Quite simply, it’s impossible to apply masterful makeup without the right tools. Forget about the tiny, cheap applicators that come packaged with most makeup. Upgrading to high quality brushes will give you much more control, immediately upgrading the look of your makeup.